The high-level working group on growth and jobs, set up at the last EU-US summit in November 2011, will give the go-ahead to launch negotiations for a transatlantic trade agreement, said Irish Prime Minister Enda Kenny, whose country holds the rotating presidency of the EU. 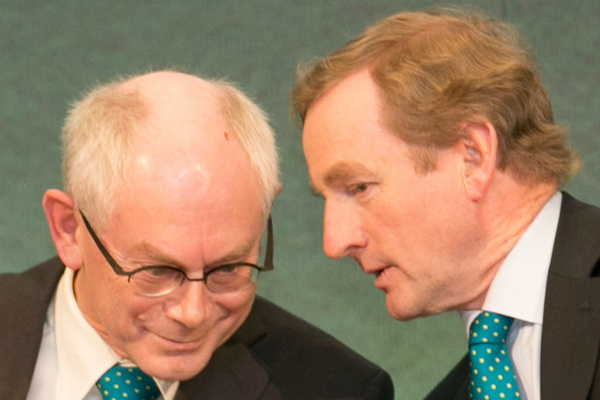 After meeting European Council President Herman Van Rompuy in Dublin, Kenny told reporters he understands the report "is favourable" to launching negotiations towards signing an agreement that is expected to boost growth and jobs on both sides of the Atlantic. The high-level working group on growth and jobs set up by US President Barack Obama and EU leaders last year to assess the feasibility of a comprehensive transatlantic trade agreement is supposed to deliver its final report by the end of the month. “With 26 million unemployed in the European Union, trade and investment are opportunities to boost growth and jobs,” he said, responding to a question from EURACTIV. The transatlantic economy generates close to €3.8 trillion in commercial sales a year and employs up to 15 million workers on both sides of the Atlantic. US investment in Europe in 2011 topped €152 billion for only the second time on record. By contrast, US firms invested $40 billion (€30.9 billion) in China between 2000 and 2011, putting China 14th as a destination of US foreign direct investment behind Belgium, France, Germany, Switzerland, Ireland, Britain and the Netherlands. Ireland has made trade agreements a top priority in its seventh turn at the EU presidency. “There is potential there for up to 2% growth in GDP across the EU,” said Eamon Gilmore, the deputy prime minister. The Irish presidency hopes to pave the way towards the adoption of a mandate so that negotiations can be launched “as soon as possible,” said Kenny. Diplomatic sources believe negotiations can start in June but obstacles remain. Bilateral trade policy cooperation has been less than optimal in the past years, analysts say. Blockages in trade remain, primarily in the form of non-tariff barriers and disparities in some’ regulations, such as pharmaceuticals, medical services and advanced electronics, but also differing standards on genetically modified crops and food safety. But no tangible results have been achieved in the last 17 years, noted the EU's employers group BusinessEurope in a recent report on transatlantic trade. Tariffs are also a nuisance, even if they are low, standing at 5-7% on average. According to a 2010 study, eliminating tariffs could boost GDP by 0.3% to 0.5% in the EU and 1% to 1.3% in the US, corresponding to gains of €44 billion to €66 billion in the EU and $59 billion to $82 billion (€45 billion to €63 billion) in the US. The Irish presidency will also try to make progress on other trade agreements, which have been in the pipeline for some time – namely with India, Canada and Japan. Negotiations with India started in 2007 and talks were expected to conclude in 2011 but differences between the two sides have derailed the agreement. Bilateral trade stood at €70 billion in 2010-11 and recent reports say it could more than double to exceed €160 billion by 2015 if the pact were formalised. Talks have slowed down due to EU demands for India to commit 49% foreign direct investment in insurance. Indian negotiators have told their European counterparts that it is not possible unless the Parliament passes the Insurance Bill. The EU also demands reassurances for its auto sector. Earlier, India had agreed to bring down tariffs on certain luxury car segments. However, sources say that EU wants India to decrease tariffs on the entire auto segment. Differences over investment protection, agriculture, public procurement and intellectual property, particularly regarding pharmaceuticals, have marred trade negotiations with Canada since talks began in May 2009. “There can be very strong difference of opinions about different issues – being they public procurement, professional qualifications or any other standards,” the Irish prime minister, or Taoiseach, said. Kenny added it was important to identify the problems and then seek a way to deliver the deal. “That is the strength of the Irish. We can call on our connections in other countries on behalf of the Union,” he said, alluding to the huge network of businessmen and policymakers of Irish-descent in a number of countries. The Irish presidency has made it a priority of its seventh presidency of the EU to finalise pending free trade agreements with third countries. Such deals are expected to deliver great gains in growth and jobs, at a time when EU domestic demand is stagnant because of the eurocrisis and austerity programmes. The presidency will hold an informal meeting of trade ministers which is supposed to lead to trade deals with Canada, India, Japan and the United States. Is the EU setting “election standards” for the USA and Canada similar to those they want to shove down the throats of Ukraine and Georgia? Super Pacs and ROBO calls! Are graded on EU ‘report cards’?? “Selective Justice”! Does this apply to Bradley Manning (900+ days in solitary without trial) or Omar Khadr (teenage warrior – Canadian citizen abandoned to Gitmo by Canada’s neo-fascist government)?? What “grade” do these two get on their respective ‘report cards’?? cf. India I don’t need any clothes from countries that fail to respect human rights, labor rights and environmental law. We are partners with B2BChannels.com and would like to work with you. We have a partner network in over 36 countries. We have a team of engineers and managers from IIT (a most prestigious technology institute in India) and sales and consulting people who have worked for companies such as KPMG, EnY, Microsoft, etc. Please get in touch with us at +91-750-30-30-185 or email us at tom_hawkins@mail.com to discuss further.We would be eager to discuss the modus operandi of such a partnership and how you could benefit in terms of more leads and more customers.